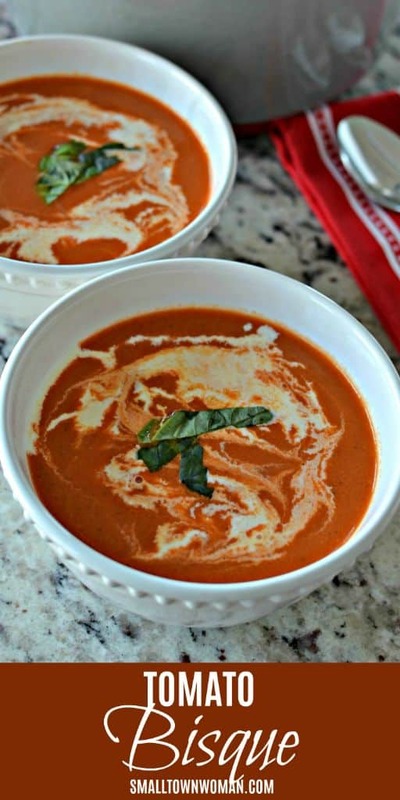 Tomato Bisque is a one pot delicious creamy tomato soup made in less than one hour. It is perfect served with Caprese Grilled Cheese or Italian Chopped Salad with Fresh Italian Dressing. It is kid friendly and leftover soup heats up well in the microwave or on the stove top. If your family is anything like mine than soup is a welcome meal. 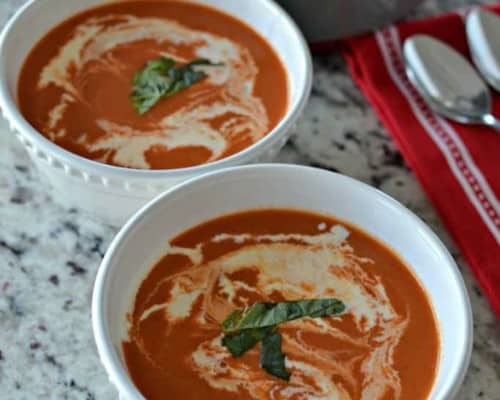 This amazing soup comes together quickly and can even be made from fresh garden tomatoes although in this neck of the woods that is not always possible. This is one of my favorite soups. Of course I absolutely love tomatoes! Heat one tablespoon of vegetable oil in heavy stockpot or dutch oven over medium heat. Add onions and celery and cook until the onions start to soften. Reduce heat to low and stir in garlic, onion powder, paprika and ground cayenne pepper. Pour in low sodium chicken broth, and crushed tomatoes. Simmer for about forty five minutes or until vegetables are super tender. Using immersion blender mix the ingredients until smooth and creamy. Stir in the cream and salt and pepper to taste. Simmer for about ten minutes. Swirl a tablespoon of cream on to the top of each bowl and swirl with a toothpick. Top with basil ribbons and serve immediately. 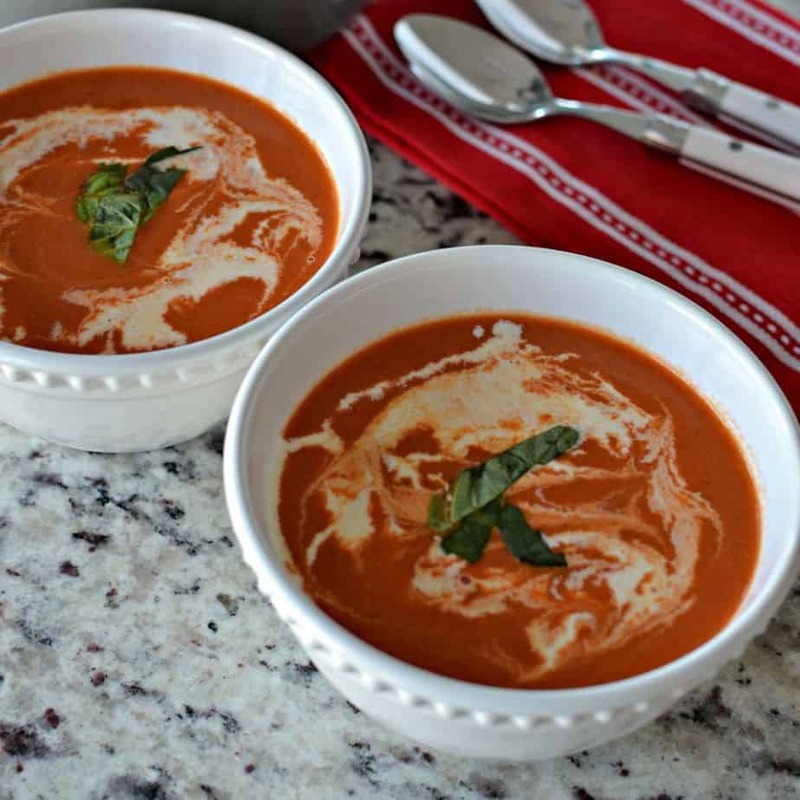 What do you serve with Tomato Bisque Soup? Oh my heavens the possibilities are endless but here are a few of my favorites! When possible use fresh roasted sun kissed tomatoes because they add so much dimension and flavor. If using canned tomatoes purchase a top quality brand like Cento San Marzano or Muir Glen. Use low sodium chicken broth as canned tomatoes are high in sodium. You can always add more salt at the end of the recipe. Simmer until the veggies are really soft. This will make it much easier to blend. If you do not have an immersion blender you can use a blender just make sure that you remove the center cap on the lid to release any steam. Don’t skip the drizzled cream at the end. Simply make a circle with the cream and using a toothpick swirl through it making an S or 8 shape. How do I roast my own tomatoes for Tomato Bisque? There is nothing better than a scrumptious sun kissed tomato. You can easily adapt this recipe to fresh summer tomatoes. Plum or Roma tomatoes are the best for this Tomato Bisque because they are meatier and have fewer seeds. Slice plum or Roma tomatoes in half. Spread in single layer cut side up on a baking sheet. Drizzle with olive oil and generously salt and pepper. Roast at 400 degrees for 30 minutes; or until soft but still holding their shape. Add the roasted tomatoes and any juice on the baking sheet at the same time in the recipe as you would the crushed tomatoes. They will add great dimension and flavor to the bisque. 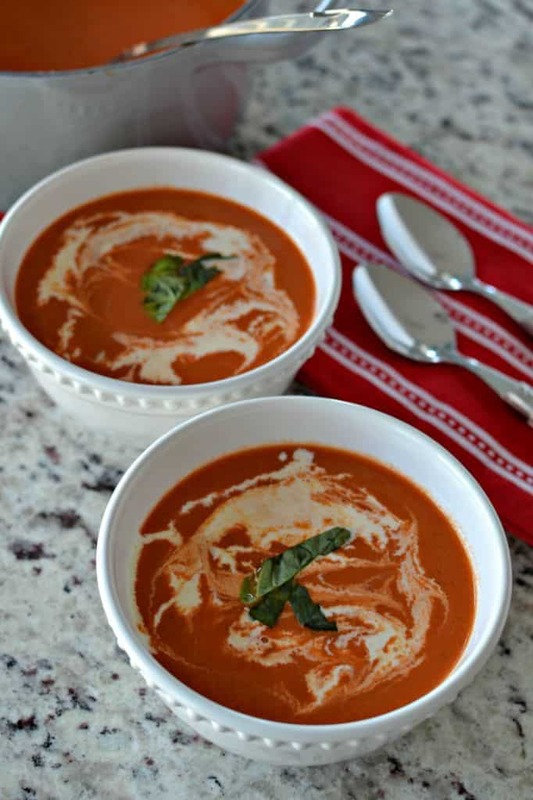 This Tomato Bisque is easy, dependable and oh so delicious! Put the ingredients on your shopping list today and make your family a wholesome flavor packed treat. 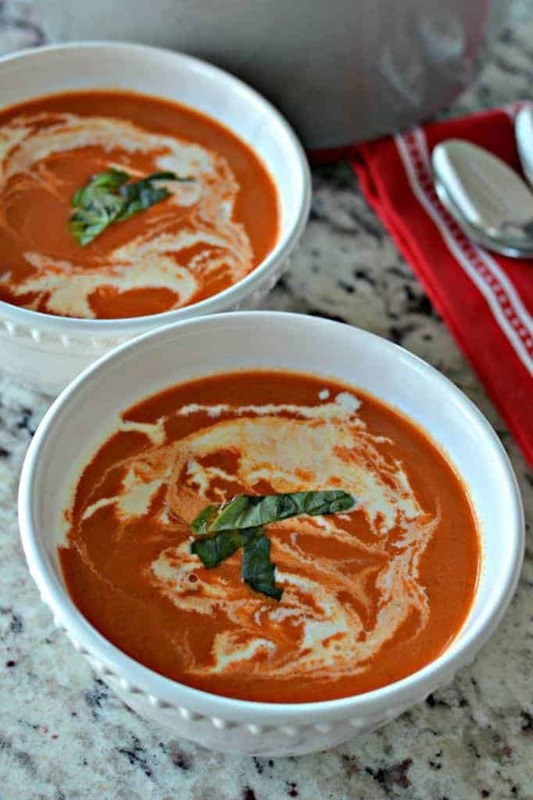 Tomato Bisque is a one pot delicious creamy tomato soup made in less than one hour. It is kid friendly and leftovers heat up well. Heat 1 tablespoon of vegetable oil in heavy stockpot or dutch over medium heat. Add onions and celery and cook until the onions start to soften; approximately 5 minutes. Reduce heat to low and stir in garlic, onion powder, paprika and ground cayenne pepper; cook for 1 minute. Pour in low sodium chicken broth, crushed tomatoes and brown sugar. Simmer for 45 minutes or until vegetables are very tender. Using immersion blender mix the ingredients until smooth and creamy. Stir in 1/2 cup cream until incorporated. Salt and pepper to taste. Simmer for 10 minutes. Pour about 1 1/3 tablespoons of cream in a circle on the top of each bowl and swirl with a toothpick. Top with basil ribbons and serve immediately. That is making me so hungry! I love any tomato based sauce or soup. That is as pretty as it is tasty, and I can’t wait to make it. Super summer and cool! To copy yummy! I have never known about this dish but believe me your photos are so inviting! Want to try it! I love Tomato Bisque soup! this recipe looks delicious and thank your for the tips! 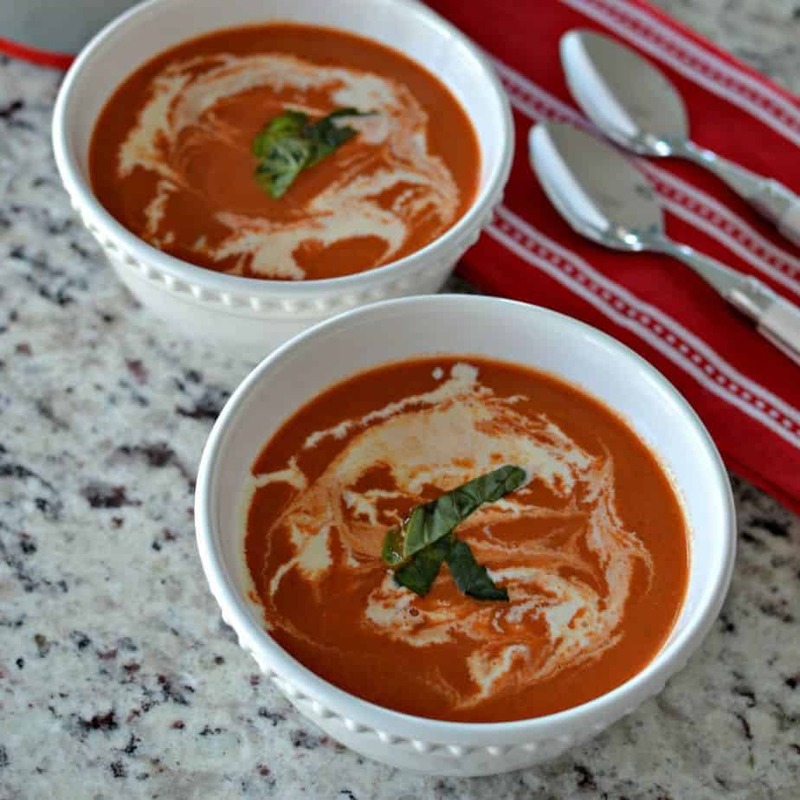 Tomato soup is one of my family’s favorites! I’ve never tried making it from scratch but I really need to! This may find it’s way to my menu plan this week. This is one of my favorite soups! I love pairing it with garlic bread; looks delicious! Hmmm this bisque looks so creamy! It’s the perfect thing for a cold spring day, great recipe! Will be making this for the family. This is one of my favorite soups! I would love to try this recipe out soon. I love tomato soups with all the delicate flavours oozing out. Nice photography and the recipe. Tomato soup is my absolute favourite!!! I am going to give this recipe a try. Yes BLT sandwich sounds a really perfect combination for this soup. It makes me hungry looking at these photos. Thanks for sharing the recipe and tips. You are most welcome Angela! I hope you enjoy it! 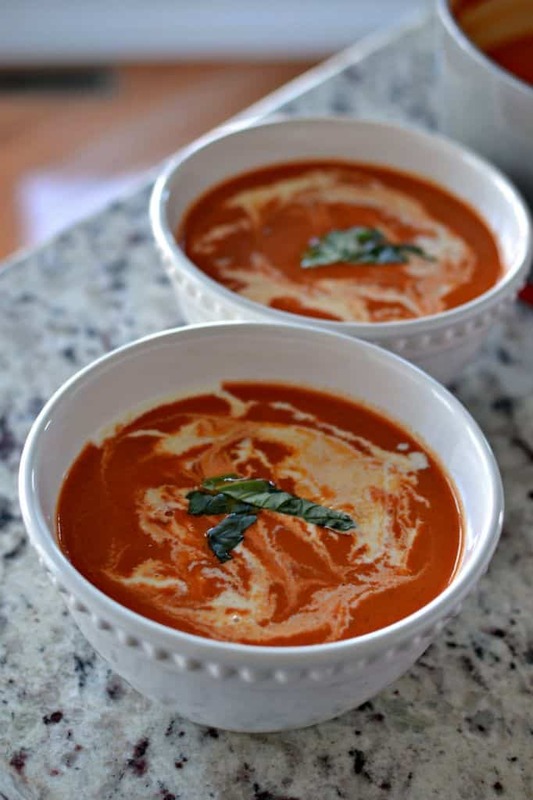 I love Tomato Bisque so excited to try your recipe. We love tomato soup but never tried Tomato Bisque and we’d love to give it s go with crusty bread and cheese! This looks so wonderful! Tomato Bisque and a grilled cheese and I’m right back in my childhood. It is the ultimate comfort food! This is such a delicious classic recipe. Great inspiration to try this tonight! This looks like it would be so delicious. I love some good tomato soup to warm the soul!